In April of 2010 the architecture community gathered to protect one of the many at risk postmodern buildings of the 1980s. 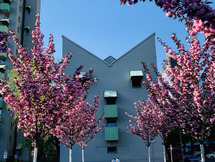 The new owners of the Kreuzberg Tower by John Hejduk drew negative attention from notable architects when they began altering the building’s façade. 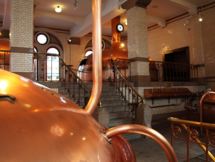 The Kreuzberg Tower’s..
A brewery's floor needs to be made of a non-porous material, with no cracks or gaps. Flooring system must also have antimicrobial properties. This is to help prevent the collection and growth of bacteria and other harmful organisms. 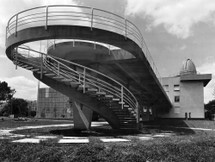 The Crematorium designed by A. Miletski is located in the "Park of Memory" in Kyiv. 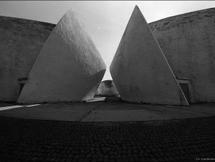 The architect constructed two crematoria in perfect symmetry and flanked the cupolas with stylised flames. The hotel “Salyut” is located on the high hill of the right bank of the Dnipro river, in Pechersk – the most prestige district of Kiev, at “Slava” Square. The turbid history of the interaction between architectural thought and the bureaucratic party apparatus is represented in the current.. 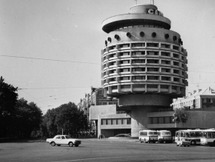 Since the late 1950s the field of Soviet architecture became more and more interdisciplinary. Popular ideas about “synthesis of the arts” were complemented with the need to maneuver between censorship restrictions that were specific for each sphere of Soviet art. The figure of architect and.. The Kiev Palace of Pioneers is an architectural attempt to develop a space which is maximally adapted to the needs of children. The unique nature of the project by architect Edward Bilsky and Abraham Miletsky and artists Ada Rybachuk and Vladimir Melnichenko is in this attempt to move away from.. 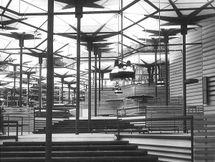 The Spanish Pavilion for the Brussels Exhibition was developed by the Spanish architects Corrales and Vazquez Molezún in 1958, after winning the competition for that. 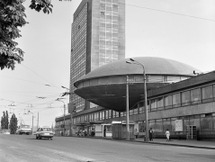 The building was asked to be flexible and re-usable after the exhibition in Brussels and so it was. Nowadays it is displayed in..
Slobodište also known as Mount Bagdala near Kruševac, is the place where the shootings of nearly 1,650 people, mainly Partisans, Chetniks, and Roma occurred during the German occupation of Serbia. 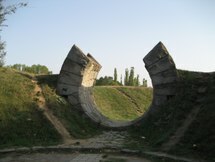 Slobodište Memorial Complex was built in the vicinity of the shootings, and was named like that..